December Birthday Bash Starts Today! Come one! Come all! 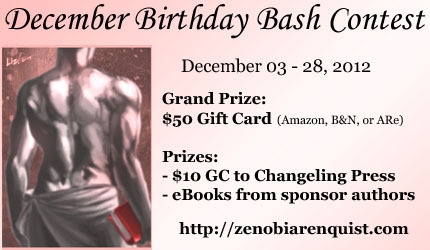 The December Birthday Bash Contest starts today! Enter for a chance to win a $50 gift card to Amazon, B&N or All Romance eBooks (winner’s choice). There will be two winners. Other prizes include free ebooks and three $10 gift cards to Changeling Press as well as discount codes. Click the image to go to the contest page. Congrats and good luck to my fellow nominees! October 15th thru the 31st! Please join me again this year for my annual Trick or Treat contest. This year, in addition to all the great prizes being donated by the authors living on my virtual street, the grand prize winner will also win an engraved iPad! But you need to play to win! This is your one and ONLY chance to win the Caveat Emptor series (all seven books). I’m only doing this once and only one person can win. Come join me at Jane Wakely’s Cover Mania to celebrate Caveat Emptor 3: Provoked Lover and Caveat Emptor 4: Anguished Lover. Leave a comment with your name and email address to be entered to win PDFs of BOTH titles. These two are best read together so I’m giving them away together. Contest ends Monday 28 May @ 12:01AM EST. Winner will be announced in the comments section of the Cover Mania post. It’s time for the Cyber Launch Party of Guardian’s Tales 1: On a Whim. Come out and leave me a question in the comments section (include name and email) for a chance to win a PDF of the new release. Contest ends 25 May @ 10AM EST. Congratulations goes out to Zeta Cole, the winner of my contribution to the Sinful Sirens Blog Hop. She got a PDF copy of Eris as well as PDF copies of Rite Men for Maya and Taking It Back. Thanks everyone for coming out and following my blog! It’s time for the Cyber Launch of Foxy: ONCE WAS LOST. Even better I’m sharing the day with fellow Changeling Press author Sam Cheever who is celebrating the release of Foxy: SPLINTERED. Two books, different authors, same great series. Come join us for a chance to win copies of both these books and to learn more about the Foxy Multi-Author Series. Have you gotten your mother a gift? How about 80 ebooks? That’s right. Tabby’s Nocturnal Nights is hosting the Mother’s Day Blowout contest. 80 ebooks will go to ONE lucky winner. Click the link below to find out how to enter. Good luck! Stop by Jane Wakely’s Cover Mania for a chance to win a PDF of CE2: TRAPPED LOVER. Contest ends 30 April (Monday) at 6AM EST. Welcome to the Easter Hunt Treasure Hunt sponsored by Read 2 Review. You’re in for a treat. Today starts 39 days of egg hunting that will lead you to the grand prize basket full of goodies. Each day you will visit a new author’s site, find the egg, and collect the letter. But that’s not all. Some authors are offering mini-contests for each contestant to enter. Visit each site, enter the mini-contests (if you like), and collect the hidden letters. Each letter is part of a phrase you will need to qualify for the grand prize. Follow hashtag #EasterHunt2012 for Twitter reminders each day of the hunt.